Do you still remember Dào Míng Sì, Huā Zé Lèi, Xī Mén and Měi Zuò? How about Dǒng Shān Cài? They were the characters that we learn to love in the most watched Taiwanese drama in the Philippines at a time when Korean dramas were not yet popular. “Oh, baby baby baby...” Filipinos would never forget the love-hate relationship of Dào Míng Sì and San chai (The Shān Cài name was dubbed in Filipino as San Chai) throughout the Meteor Garden series for it was one of the first few Chinese dramas that were presented in the Filipino language. It was not the first one but it’s started a wave of Asian dramas in my country. The show was so popular that Jerry Yan even went to the Philippines and answered a courtesy call in Malacañang Palace. Haha! Back in 2003, I was a freshman at a prestigious university in Manila. My school was just a walking distance to Morayta Street where it was full of vendors selling wallet size photos of the F4 members. It was funny to see college students especially the girls to buy this kind of stuff as if the F4 was also studying in their respective schools. Every student at that time might be thinking that their school was like Ying De University. Just imagine four sons from super-rich families bully poor students whose only dream was to get a college diploma. Well, the story of Meteor Garden was just a work of fiction but its filming location is an actual school. Ying De University in real life is the National Chung Cheng University (NCCU) in Taiwan's Chiayi province. To go to Chiayi in an instant, board the THSR train. Departure times of Bus 106 from TRA Chiayi Station. Departure times of Bus 106 from THSR Chiayi Station. Bus 7309 from TRA Chiayi Station can also take you to NCCU. Schedule of Bus 7309. The left side is for the TRA Chiayi Station to NCCU route while the right side is the return trip. Meteor Garden fans will not feel anymore the discrimination by rich students in Ying De University. Thanks to tripool taxi, you can now board immediately in a private car after you arrive in THSR Chiayi Station. There won't be any need to talk to the taxi drivers in Chinese outside the bullet train station and haggle for a reasonable price. Just book the tripool taxi via the web app (https://www.tripool.app/?utm_source=luomuji) at least one day before your trip (cut-off time at 6:00 pm) and your personal driver will take you to Ying De University in less than 40 minutes. Be like a boss. Arrive and leave the campus at your own pace just like Sanchai. Those who will not reserve will receive a red card from the F4 in the locker room. I traveled all the way from Taipei to be the first Filipino blogger to give an in-depth analysis of the university that became the dream school of many. So are you now excited to explore NCCU? Let me tell you first how to get here. There are two public buses that would take you the land of Meteor Garden. At the bus station beside the train station of Chiayi, board either Bus 7309 or Bus 106 (Taiwan Tour Bus Southern Branch of the National Palace Museum route) and you will be there in less than an hour. The former would make a stop near the gate of the university while the latter would enter the campus to drop off its passengers. The same buses make a stop in Minxiong Station so it's better to just wait at Chiayi bus station for your convenience. But if you really can't wait to see NCCU, then ride a taxi. Just prepare the Chinese name of the NCCU on a small piece of paper to tell directly to the taxi driver the place you want to visit. Since I'm a budget traveler, I chose to board Bus 7309 at 11:00 am and I used my EasyCard to pay for the fare. I was first nervous when I saw the gate of NCCU. I was standing on the other side of Section 1, Daxue Road and it seemed that not everyone can enter. But anyway, I crossed the road and I found at that there was no guard to stop any visitor in seeing Taiwan's most beautiful university. There is actually nothing to worry because NCCU is part of the Taiwan Tour Bus SBNPM route and it's now a tourist spot that anyone can enjoy. on top of the bridge / Chung-Cheng Blvd. There were two things I need to accomplish during my visit to NCCU. The first was to search for the legendary lockers where San Chai and the other students of Ying De received their red cards from the F4. My second task was to identify the romantic rooftop where San Chai and Lei have their sweet moments. With these two things in mind, I walked over the bridge built over the Tranquility Lake to start exploring the campus. Just looking at the view from the bridge gave me a glimpse of the beauty of the Ying De University. I did my homework before going to NCCU. I studied the campus and watched the series again to equip my mind with the right information on this adventure. Searching for the lockers on the campus was like looking for a needle in a haystack. NCCU is a very big campus and I already knew that it was impossible for me to find it. I was just hopeful that I could discover its location. So I started on the “rooftop” because it was the easier one to identify. Google Maps gave me an idea of what the campus was all about. Its layout and its iconic buildings were accessible with just one click of a mouse. While watching the drama, I noticed a Shinto stone lamp structures on the right side of Huā Zé Lèi in one scene. Lei was sitting on the rooftop and an idea instantly popped in my mind. Eureka! ... until I found this bus stop. The “rooftop” must be near the Shinto-looking structures. Based on the campus map of NCCU, the place is called the Central Fountain and I was thinking to get here immediately. I was still walking on the road when I noticed a bus stop. I went near to it because I wanted to know the time of the last bus that would leave NCCU and go back to Chiayi Station. Two Students were sitting there and I took the opportunity to ask them about “Meteor Garden”. I opened my smartphone and showed them the poster of the drama and they both smiled. The students knew that their school was the set of a famous Taiwanese drama. A screenshot from Meteor Garden (2001). San Chai and the lockers. A screenshot from Meteor Garden (2001). Aside from Lei, our protagonist also had a scene where the Central Fountain was seen. I then showed them screenshots where San Chai was with the lockers and the rooftop scene where Huā Zé Lèi was visibly seen with the Central Fountain. “Do you know where I can find these lockers?”, I asked them. “In the library”, one of the students replied. “How about this rooftop?”, I asked them again. “Business Ad building”, they both replied. “Bingo!”, I told myself and I felt elated with the information that I got from these students. But in the middle of my excitement, they told me that I cannot enter both buildings. Anyway, I was still happy with their tip and I thanked them for them for their help. Even if I could not see the lockers I would still be proud to tell it my blog readers that I knew their location. The Central Fountain with the Library Building behind. The Auditorium is on the left while on the right side are the bell towers. My original plan was still on track and as I got near the Central Fountain I noticed a pyramid looking building. It was actually the Administration Building and its weird shaped made it worthy to have a selfie. Ying De University in Meteor Garden was portrayed as a campus with a large quadrangle and it is now a big lawn with large trees. There were picnic tables and perfect for having snacks while under the hot summer sun. I took some pictures of myself in the quadrangle as the towers of the Administration Building rung telling everyone that the time had passed another hour. Suddenly, water sprouted in the fountain and I rushed to take a video of it. It was like an ordinary water show but the when water suddenly came out of the stone lamps it brought magic around its vicinity. The rays of the sun shone on the water droplets creating a mini-rainbow. I circled the fountain as it blew water towards the sky and I found out that the view was better if the Administration Building was in the background. The fountain together with the stone lamps and the Administration Building became a fusion of Japanese and Mesoamerican architecture. I had been to National Taiwan University in Taiwan Day 224 (Pride of Formosa) and National Cheng Kung University in Taiwan Day 434 (Campus Notes). They both have Japanese-era renaissance buildings but to have a Mayan-like pyramid building was something that only NCCU have and should be proud of. The campus map of NCCU. No. 12 is the Auditorium, No. 5 is the Administration Building and No. 22 is the Library. At the two opposite ends of the quadrangle were the two large buildings of the Library and the Auditorium. I first thought that the Auditorium was where the rooftop scene was taken in Meteor Garden and I imagined Huā Zé Lèi as he sat on the balcony. It was actually too high and dangerous for someone to be in that position but I guessed that the scenery of the campus would be great from the top of the Auditorium. You would see the green color of the quadrangle, the Shinto fountain and the Library building on the far end. Somehow I got puzzled if the balcony of the Auditorium was really the location of the “rooftop” scene where Lei and San Chai always met. As I watched again the drama, I noticed in one episode that the Central Fountain was on the right side of Lei. Hmmm… Something must be wrong. NCCU Library. The famous lockers of Meteor Garden are located on its basement. Thinking that the Auditorium building was the Business Administration building that the students that I met at the bus stop told me, I left the area and proceeded to the Library to take at least a selfie. But when I got near to the building I was surprised that it was open and students just enter the door without showing any ID. Fire was burning in my eyes as I entered its first floor. My heart was full of thrill and excitement because I knew I was getting closer to the legendary lockers of Meteor Garden. At the lobby, I turned to my left and I saw this spiral staircase. ... until I discovered the legendary lockers of Meteor Garden. There was no need to show an ID at the entrance since the books of the library were inside the big rooms of the building. I even saw students swiped their IDs on a sensor just to enter its premises. It was a big relief but the big question still remains on my mind, “Where are the lockers?”. I don’t have any idea about their location and it could be inside in one of the rooms of the library. But luck was really on my side because when I turned my head to the right I saw a spiral staircase. There was also this force that was pulling me down to the basement so I went downstairs until I found what I was looking for. Lockers! A total of 288 lockers for lease were in the basement and grouped in 12 big compartments. Every giant cabinet has 24 small boxes with doors arranged in a 4x6 configuration. Students used a regular metal key to open and close the door with a knob placed above the key hole. “Which among these lockers was used the one used by San Chai?” I asked myself as I opened again my smartphone and reviewed my notes about the scene when our female protagonists opened her locker and found no red card. Do you know what her locker number is? It is locker #150. Hello to all Meteor Garden fans! I found the lockers. Haha! I couldn't contain my happiness as I gazed my eyes upon the lockers. I'm a fan of the series but never in life that I imagine that I would be standing in front of the lockers that was used in the drama. But in spite of being happy with the experience, I refrain myself in touching, again and again the large cabinet. I knew and I could feel that there is a CCTV camera somewhere and I don't want to leave a bad impression in NCCU and be the cause of banning outsiders from seeing the lockers. After taking photos of the lockers, I went back to the Auditorium and tried to convince myself that this building was the location of the rooftop scene. I was not yet sure at that time so I focused my energy on my next location: the place where San Chai was kidnapped. In the drama series, our beloved female heroine was kidnapped by two men and put inside a car. The vehicle then ran in a zigzag motion because San Chai wanted to get out. Later, it was revealed that it was Dào Míng Sì who was the mastermind of the kidnapping. I go this photo from the Auditorium building and this became my clue. I also wanted to find that famous sidewalk on the campus where San Chai and some of her friends enjoyed their talk while walking. The sidewalk was lined with tall trees on both sides with a lane provided for passing cars. I was clueless on where to find this spot and I even forgot to take a screenshot of that scene in the drama. But I was still lucky because I remembered a large photo on the glass wall of the Auditorium building. It was similar to the sidewalk in Meteor Garden and I used that to show to the students in NCCU. A young guy on his bicycle became my savior and he ordered me to follow the road on my right until I find a street lined up with trees. I then should turn right again to find the epic sidewalk. I was facing the Auditorium building at that time and I simply followed his instructions. On the way, I passed by the College of Management building and took some pictures there. A road similar to what I was looking beside the building of the College of Social Sciences. I got attracted to it and turned left to check it if it was the place I was searching for. Living Road circles around the campus and it was beautified with tall trees great for walking. A special lane for biking made it terrific to stroll around the campus while burning some calories. The road was flat in the area behind the College of Management and I was not convinced that this was the place where San Chai was kidnapped. The sidewalk here has only tall trees planted on one side making it not the location of the scene where San Chai was talking with her friends. I then remembered what the student told me that I should turn right. So I walked back and passed the Parking Lot and the College of Social Sciences building. I passed by the Activity Center. A student was struggling to cycle and it means that he was cycling uphill. I already passed by the Activity Center and the Living Road seemed not to end until I noticed that the road was beginning to slope downward. I investigated further up to the University dormitories and the sidewalk became adorned with tall trees on both sides. I found it! This was the place where San Chai was seen walking with her friends in the drama. The road beside it goes downward in an endless fashion and it must be the same road where the kidnapping scene of San Chai was filmed. I recorded videos of cars going to the Track and Field area and my theory was correct. Watching vehicles as it goes downward on the road is a perfect place to capture an unforgettable scene in a drama series. Do you remember this place in the drama? Do you still remember Shing Ha Ha (Chen Qing He)? He was the childhood friend of San Chai and they first met somewhere in Ying De University. At that scene, San Chai was walking on a bridge and she saw her friend on the other side. Shing Ha even tried to run just to meet his love interest. The two friends were on the bridge when they saw the F4 on the ground. Hmmm.... My intuition tells me that the place must be the Activity Center. There were lots of students on that scene in the drama and I remembered when I was walking along Living Road there were Indonesians or Thai people who came out from that building. The solar panels of the Activity Center. Yeah! The F4 walked over this staircase. The campus map again of NCCU. No. 2 is the Activity Center. So I entered the Activity Center and I was surprised with its numerous solar panels on its roof. It was a big building with a spacious atrium inside. The structure was more than three floors high with two bridges and a spiral staircase to connect the different floors of the building. And there was this grand staircase! I remember the scene while Shing Ha and San Chai was on the same bridge and they saw the F4 while walking down the stairs. Shing Ha tried to call the attention of the F4 and San Chai successfully stopped him by covering his mouth. A scene from Meteor Garden (2001). San Chai and her childhood friend Shing Ha. The view from the Activity Center. Asi stood on one of these elevated walkways and he saw his girl with Shing Ha while they were on the Tranquility Lake. Poor Shing Ha! Asi saw him and San Chai while the two were enjoying the view of the Tranquility Lake. If you are standing on one of the two bridges in the Activity Center you will have a great view of the lake on your right while on your left side is the atrium of the building. We knew that Asi is a very possessive person and easily gets jealous of men getting close to San Chai. Haha! And as expected Shing Ha gets a red card from the F4. Yikes! But beyond the drama in the Meteor Garden, the Tranquility Lake was very beautiful and shouldn’t be left unnoticed. It is one of the must-see places in NCCU and your tour in this university won't be complete if you haven't seen this place. It was very scenic that I thought it was a river during the days that I was watching Meteor Garden. Ying De University became more enchanted in the minds of the viewers with a river flowing below a European-style bridge. I walked around the lake and it was a big reservoir full of fowls. Ducks and swans float above the water as if they were the owners of the lake while the insides of the numerous arches of the bridge became a home of a number of birds. Below the bridge were two waterwheels that create artificial waves. Without these machines, the Tranquility Lake would be a breeding ground for a million mosquitoes. 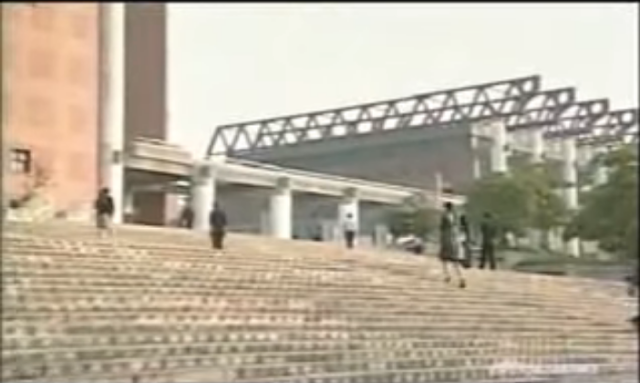 The continuous staircase in Episode 1 of Meteor Garden was just a camera trick. A scene in Meteor Garden (2001) Episode 1. Ying De University "entrance"
Everybody had been fooled that the grand staircase was the entrance to Ying De but it was just a place where students go to have their P.E. class. The grand staircase in the first episode the series, where is that place? It's no other than the Gymnasium. The iconic gray metal scaffoldings on the top of the building were now red in color but the stairs were still there – all in its glory. The director of Meteor Garden was successful in creating an illusion of grandness by choosing the right angle to create a continuous set of steps that someone would need to climb before entering the university. It was like going up to a holy temple. I also remembered how Bai He and Qian Hui flaunt their expensive apparel and accessories after showing a short clip of the staircase (I'm not sure if the scene of the two bully ladies was still in the gymnasium. The columns of the gym were too big and circular compared to the one I saw in the drama). That scene of the two bully ladies plus the staircase instilled in the mind of the viewers that the students in the university were super-rich, belong to the elite society and can buy everything with their money. They were like children of the Gods. In other words, to be in a school like Ying De is a dream and a fantasy to many. The campus map of NCCU. These are the buildings to see when you visit NCCU: Administration Buildiing (No. 5), the Auditorium (No. 12), Library (No. 22), Activity Center (No. 2) and the Gymnasium (24). A scene in Meteor Garden (2001). San chai went to rooftop after punching Dào Míng Sì. This scene shows the Library building on the left. NCCU Library. Going farther away will give you the same perspective of the top floors of the building like what San Chai saw in the drama. Now before we move to the closing paragraph of this blog post, let us solve first the mystery of the famous rooftop where San Chai and Lei had their sweet moments. I was already back in Taipei when I reviewed again some of the episodes of the drama. There was a sequence of events when San Chai got her first red card from the F4. Her life became miserable in the university and was even going to be raped by two men. San chai was lucky to be saved by Lei but later found out that it was Asi who planned the idea. She eventually got angry and punched Asi when she met him on the campus. Our female protagonist then went to the rooftop and shouted that she would never succumb to the F4. Her moment at that place clearly shows the Library building. It was so big that if the same scene was filmed in the Auditorium it would be too far away. Had it been that way the Library would then be so small on our television screens. My observation was also consistent with the scene of Lei on the rooftop. He was fond of sitting on the balcony and if you are a keen observer you would see that that Central Fountain was on his right side. So what's the verdict? The rooftop scene was not filmed from the Auditorium but rather on the Administration Building. It was the Business Ad building that the two students at the bus stop told me. I also conclude that there was no rooftop but the scenes were probably taken on the balcony of the second floor. The Central Fountain at the side of the Library. This is where Bai He and Qian Hui made false accusations about San Chai. So there you have it! There are three important places on this campus that you have to see when you visit NCCU. First, the library. This is where the legendary lockers are located. Be careful when you try to open the lockers because you might get a red card. Haha! Second, the Administration Building. If you happen to visit on a school day and you can get inside, try to go to the balcony and see if there is someone enjoying the beauty of the campus like what Lei did. Third, the Central Fountain. The Library and the Administration Building are just beside this beautiful part of the campus. This place was shown a lot of times in the series although not that obvious. Remember that on this fountain (in front of the Library) Bai He and Qian Hui made false accusations about San Chai. They showed Dào Míng Sì a video of his love interest and Lei on the rooftop. Oh well! We knew how Asi reacts when someone is near his girl. Great! 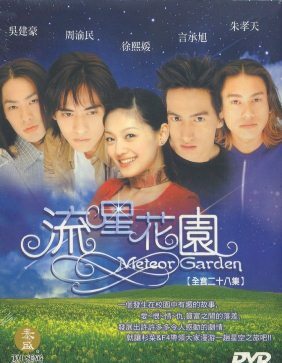 I have made a long article about the real-life set of Meteor Garden. However, there were still places I failed to cover. Where is that place where San Chai slapped Dào Míng Sì because he was about to go to New York? How about the classrooms? What does it look like inside? These and other scenes in the drama will probably my next agenda if I had another chance to visit this school. Hooray! To the millions of Meteor Garden fans: This place in Taiwan is waiting for you. Relive the moments of San Chai and the F4 in National Chung Cheng University aka Ying De University. 1. Board Bus 705 and alight at THSR Taoyuan Station. You can also board the train of the Taoyuan Airport MRT at the A12 or A13 Stations and then get off the at THSR Taoyuan Station. 3. Board Bus 106 (Taiwan Tour Bus Southern Branch of the National Palace Museum route) and alight at NCCU. 3. If you took a THSR train, board Bus 106 (Taiwan Tour Bus Southern Branch of the National Palace Museum route) and alight at NCCU . If you choose to arrive in TRA Chiayi Station, follow the procedures in method C.
C. HSR Chiayi Station -> book a car in tripool taxi (https://www.tripool.app/?utm_source=luomuji). Schedule your private point-to-point transportation based on your arrival time in the bullet train station. Or ride the Taiwan Tour Bus. Tip: schedule your bullet train arrival based on the timetable of the bus. D. From TRA Chiayi Station: There is a bus station beside the train station of Chiayi City. Board Bus 7309 or Bus 106 then alight at NCCU stop. Bus 7309 will stop in front of the university along Section 1, Daxue Road while Bus 106 will enter the campus. E. From Minxiong Station: Both Bus 7309 and Bus 106 make a stop at this train station. You can ride a taxi to take you to NCCU if there is no bus yet at the time of your arrival. F. By tripool taxi: https://www.tripool.app/?utm_source=luomuji Type "National Chung Cheng University" as your destination and for your pick-up point, choose either THSR Chiayi Station or TRA Chiayi Station. Hi what day did you go there? Can I go back to Taipei on the same day? I went there on Jan. 1, 2017. You can go back to Taipei on the same day via HSR.